The FS730/3 Series Distribution Amplifiers are used to distribute CMOS level logic pulses. Each amplifier has one input and seven outputs, all on BNC connectors. All inputs and outputs are logic levels. 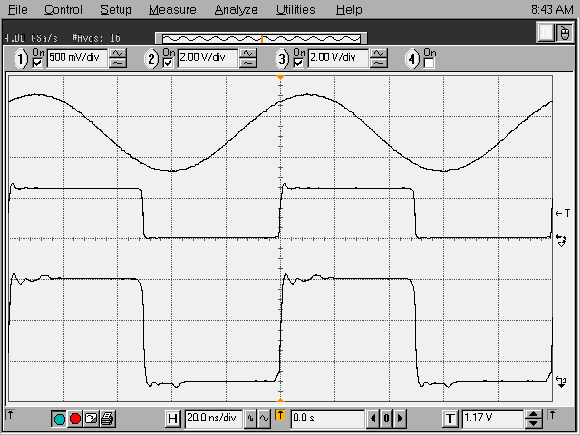 The Schmitt trigger input has a switching threshold of +1.3 VDC with 0.35 V of hysteresis. The input impedance is 1 kΩ. Each output has a 50 Ω source impedance with logic levels of 0 VDC and 5.0 VDC. The 50 Ω source impedance will reverse terminate reflected pulses when driving unterminated lines. High impedance loads will be driven to 5 V and 50 Ω loads will be driven to 2.5 VDC. All of the outputs are driven by separate drivers to provide high isolation. The outputs have fast transition times and very low overshoot. The polarity of each output may be configured with a jumper inside the unit: installing the polarity jumper inverts the corresponding output. As shipped, the outputs are non-inverting. The unit has two indicator LEDs. The “power” LED indicates that the unit has ac power. The “signal” LED will flash for 100ms on each rising or falling edge seen at the input. The FS735/3/3 model provides 14 output BNC connectors on the rear panel, with status indicators on the front panel. Several types of distribution amplifiers are available as listed below. Different types may be combined within the FS735 chassis. Delay skew <±1 ns, typ.